Share Our Strength Day of Service: Capital Area Food Bank 1,100 Boxes of Food Packed Today! Today I was part of an awesome social media capture team for the Share Our Strength Day of Service at the Capital Area Food Bank. Thought I'd share this video. Great work! I started my Day of Service experience at Friendship Public Charter School at the Southeast Elementary Academy in the school cafeteri where volunteers were hard at work painting two murals. Both murals illustrate the idea of nutritional eating. I met both of the artists and did live stream interviews with them. I also talked to the volunteers about why they were so passionate about the issue of ending childhood hunger. 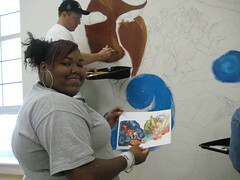 Latoya Middleton, photographed above, shows off her design while volunteers were busy painting in the design. The mural depicts mother earth who gives life and food next to a healthy selection of fruits and vegetables. Latoya was thrilled to her design come to life before her eyes. I also met Alex Volkonsky who design depicts whimsical vegetables and fruits as well as a milk cartoon (emphasizing the need to children who need to drink their milk everyday for healthy bones). I interviewed him about his work on qik. I met Michael Farver one of the volunteers. Michael is a founding director and President of End Childhood Hunger. He is also a trustee of The Farver Foundation, a charitable foundation supporting hunger relief, child nutrition, education and community development, and helps oversee the distribution of over $400,000.00 in grants to more than fifty charitable organizations in Michigan and South Florida each year. Michael also uses different social media strategies to get the word out about childhood hunger in America and spoke about why it is important for activists to incorporate a social media strategy. 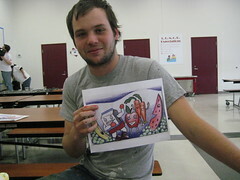 Below are my flickr photos from the mural projects in the cafeteria. Today, I'm participating in a Day of Service along with almost 200 conference participants at two of their partner sites, the Capital Area Food Bank and Friendship Public Charter School - both organizations address hunger and poverty issues. The Day of Service, sponsored by Tyson Foods, will be an opportunity for conference to give back to organizations in the host community. We have a team of social media volunteers who youtubing, blogging, flickring, and Twittering the work by these dedicated volunteers. Over at the blog, you can read some of the live posts or see videos about the Share Our Strength Day of Service. The qik video documents some of the tasks the volunteers are doing today. The goal is to pack up thousands of food boxes for local pantries. The large bins are filled with items that are collected in local grocery stories. The volunteers sorted them into boxes and the boxes are being boxed up for 700 agencies, a combination of food pantries and soup kitchens - any nonprofits that are cooking or distributing food for those who need it. In addition, they packed up 1,100 backpacks for kids filled with food items. These backpacks are essential because these children will not have food over the weekend.